Rebecca Nelson, RN, BSN, joined Allergy of Associates of La Crosse as the Graded Oral Food Challenge coordinator. She received her bachelor of nursing degree from University of Phoenix and her masters in nursing, education, from Capella University. 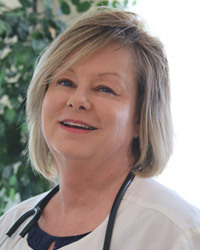 Having more than 30 years of clinical nursing experience, Rebecca has worked in critically demanding specialties such as Emergency Room, Infectious Disease, Oncology, Interventional Radiology, ICU, and Endocrinology. Rebecca has carried those skills over to her work with our physicians in our state-of-the art program providing graded oral food challenges in a safe, comfortable environment. Rebecca is credentialed in CPR, ACLS, PALS, TNCC, ENPC, and is a Certified Diabetic Educator.